1. Where’d You Go, Bernadette. Around Christmastime, my friend and her sister asked if I could do a photoshoot of them so they could turn the images into a gift for their parents. I agreed, and they were nice enough to give me a gift in exchange, including this book (which was already on my TBR). 2. The XYZ Factor: The DoSomething.org Guide to Creating a Culture of Impact. My scholarship program at school always gives out the best swag at events. This book was in our end-of-year banquet giveaway and it looks like a quick but meaningful read. 3. The Brief Wondrous Life of Oscar Wao. I borrowed this from my sister so I can read it for the Read Harder Challenge. 4. The Glass Castle. The Friends of the Library in my town has this adorable little store called the Booktique where they sell donated books SUPER CHEAP to raise money for the library. This book was on my TBR and cost $1 so of course I bought it. 5. The 4-Hour Work Week. Another Read Harder Challenge book that I checked out from the library and am currently reading. 6. Mouthful of Forevers. This is a book of poetry written by someone I know from the Portland Poetry Slam. I’m obsessed with her spoken-word, so I figured I’d support her by purchasing her latest release on Amazon. 7. Order of Seven. Another Amazon purchase to support someone I know, this time a bloggy friend I helped to promote awhile back because I figured if I loved her blog, her YA novel would be just as delicious. I’m also currently reading this and it’s great so far. 8. A Dirty Job. While this one went back to the library only half-read (read why here) so it’s no longer technically in my possession, it still makes the list because of recency. 9. Luck. If your library doesn’t sell withdrawn books in the entryway, you should start going to better libraries. For 50 cents, I took this one home with me–if the back cover doesn’t deliver what it says it will, that’s not much of a setback. 10. Waiting for Snow in Havana. Another cheap Booktique find on my TBR list. I can’t wait to read this one. What books recently came into your possession? 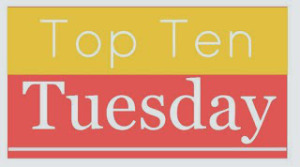 Top Ten Tuesday is a weekly book blogging event hosted by The Broke and the Bookish. I loved Four Hour Work Week! Even though my business is small and personal, the time management tips helped with how I do life, even folding my laundry or returning my personal emails. You’ll really enjoy it! I don’t have a business so we’ll see how relevant it is to me! I have Waiting for Snow in Havana and it’s been sitting on my shelf for so long! I should get to reading it. I only buy ebooks and I mostly get the free ones. However, I did just last night purchase and start reading Go Set A Watchman. I also bought a couple of books by fellow bloggers (Melissa Barker Simpson and Rebecca Bradley) and my mom wanted to read a Danielle Steele novel so I bought it for her (she is on my Kindle account so what I buy is also available for her to read). I bought a children’s book, too. Note that most of my acquisitions aren’t even purchases! (and when they are, they’re hardly ever full price) Why pay huge amounts for something you might only read once, or might not even like enough to finish–that’s what libraries are for! Great list! Where’d You Go, Bernadette is one of my favorites! Such a fun, cute read. I need to get on it, then! I’m definitely excited for these. Happy reading to you too! The Four Hour Work Week is good, and I enjoyed The Glass Castle more than I thought I would. Great list! I need to get “Mouthful of Forevers.” I love spoken word poetry (and write a bit myself) so I try to consistently support Portland poets. There is so much talent int his town.